Well, I gave into another of Julia’s great ideas and linked up to Taylor at the Undomestic Momma and Top 2 Tuesday. 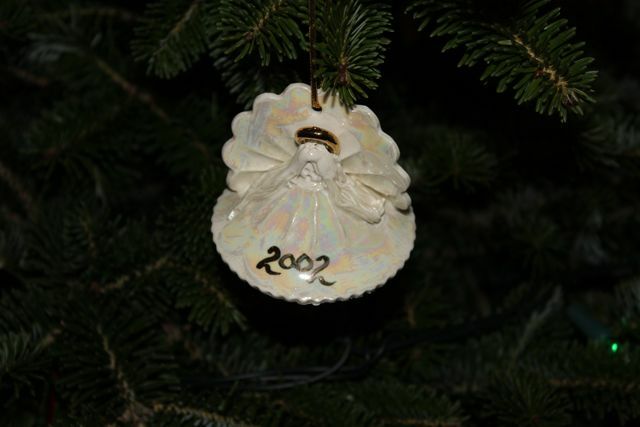 I was planning to post about our favorite Christmas ornaments anyway, so why not? 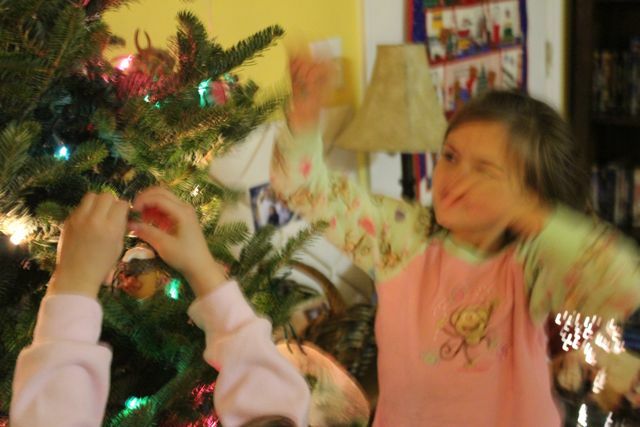 Plus, this follows up my First Day of Christmas Blog by letting you know that despite the, um, unwelcome visitors we’re currently hosting, we did find time to decorate the tree. Finally. 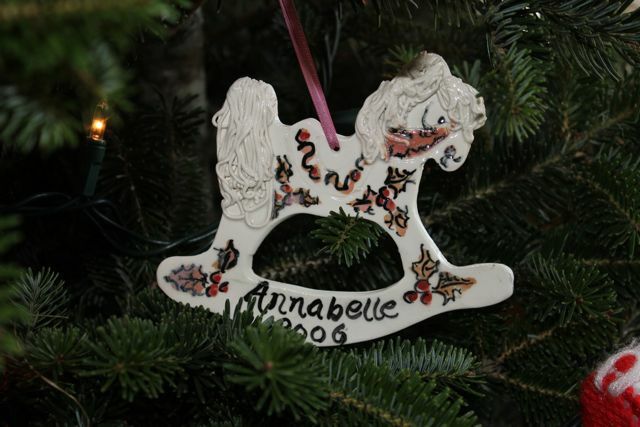 Top 2 Favorite Ornaments? It’s so hard to pick just two…so I’m cheating and choosing categories. That’s right, sometimes I break the rules. 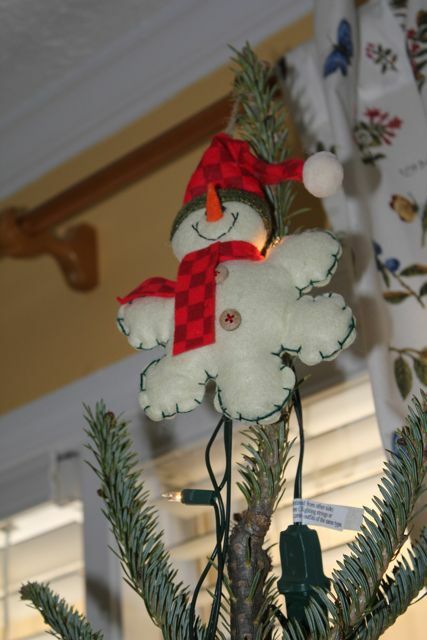 Category 1: Ornaments with meaning. This year we chose this sweet little snow baby from one of my favorite places, Target. It’s special not because we bought it on a trip that didn’t make me regret shopping with three kids by myself, but because it represents the biggest change in our lives this year…the year Annabelle became a big sister, too! Category 2: Think Pots Ornaments. 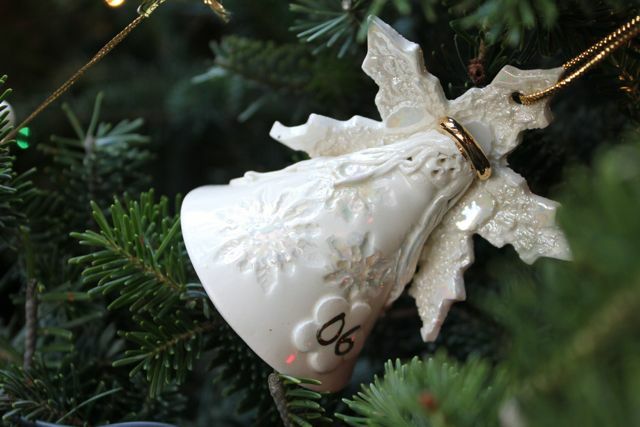 Joshua’s Aunt Beth is a potter and her beautiful work is the showcase of our tree. In a few years, I’ll have enough to have just a “Beth Tree” and I can’t wait. 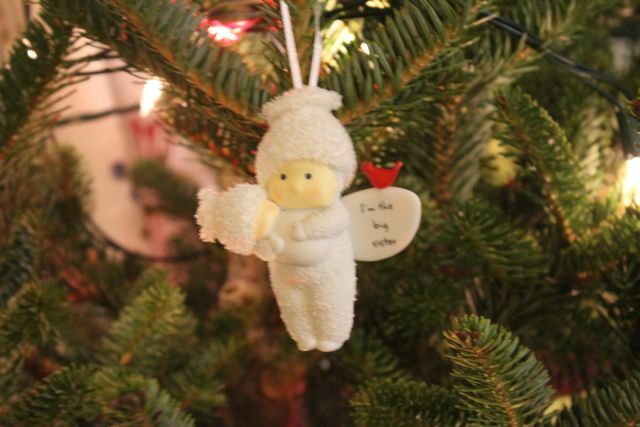 Each year she gifts us with a handmade angel (which are my favorite ornaments of all time) and she has blessed us with beautiful ornaments commemorating the birth of our girls. Can’t wait for Amelia’s! Well, here’s the finished project…as well as a couple of moments in the process. The first of many “No, Amelia!” shrieks. As for the Second Day of Christmas tip for enjoying the soul of the season….don’t worry about the perfect tree with the perfect combination of coordinated decor. 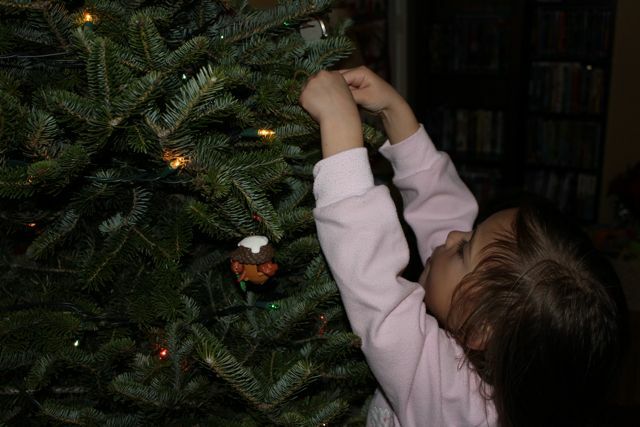 We always have a lot more fun when I carefully place the ornaments I love and don’t worry that the girls have hung the bottom half of the tree with their macaroni and cardstock creations. Although, this year I did give in and let them pick and decorate a tree for their room…it’s purple, plastic, and perfect for the girls! Maybe I’ll get a pic of that soon. Have a great Tuesday. And remember when you’re stressing today you could be at my house with a cup of hot cocoa and a fine tooth comb. 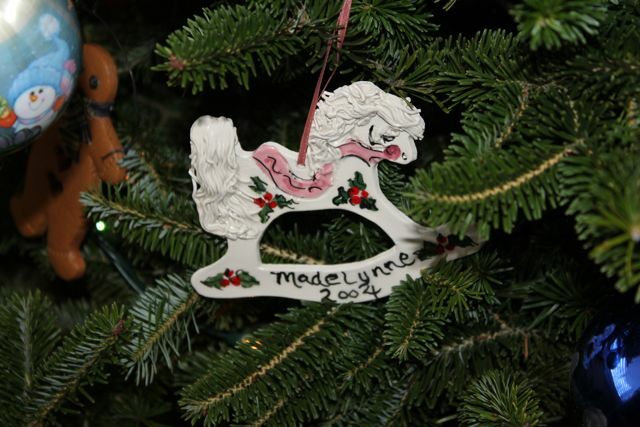 yay for linking up and yay for fun ornaments!! 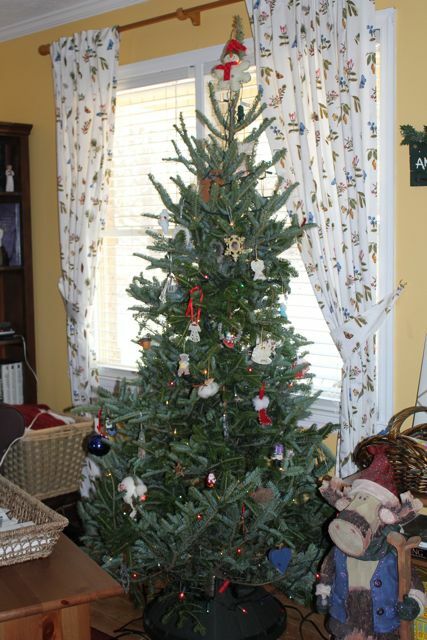 LOVE the tree… i SO, SO, SO miss a real tree. Great choices….I love them all! What cute ornaments. I love that colorful rocking horse!